I know this isn’t a ground-breaking statement because who doesn’t love snacks?? They’re a magical component that fits nicely between meals so that you don’t go crazy or get too hangry. But, they’re tricky in the sense that many people gravitate towards less-healthy options because they’re the easier, faster, tastier option. Suddenly, the vending machine at work is your best friend and you know the schedule of the worker who restocks it… I swear I only know his schedule because he happens to restock during our daily morning break – it’s coincidence only. 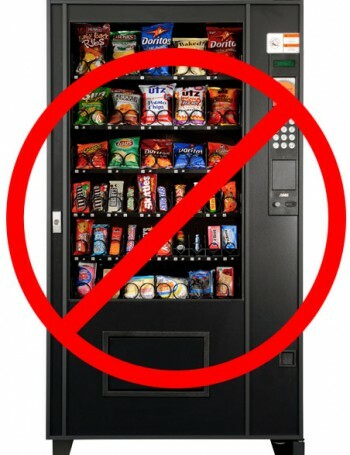 Planning ahead and bringing your own snacks can help you avoid this as a solution. I try to keep my snacks as healthy as possible and thought I would share my top five choices here, in case they interest someone else or they just help you think of a different option. It’s always nice to switch things up! Caramel rice cakes and almond butter. Bonus points for adding half a banana or some raisins. 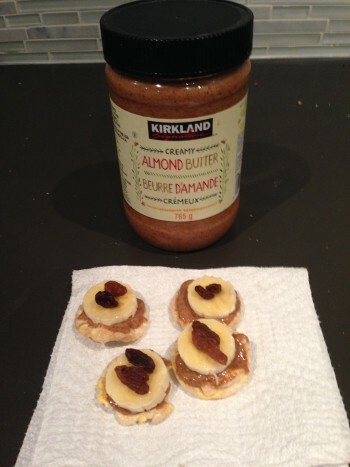 A cute version of my #1 snack – mini caramel rice cakes with almond butter, a banana slice, and some raisins. I could easily eat rice cakes for all my carbs I think. 2. Home-made protein baked stuff. This might not be for everyone, but I love baking random things when I have the time (usually on the weekends). Some ideas are under the Food tab. You can get creative and add in whatever you want / have on hand (raisins, shredded carrots, white chocolate chips, etc.). 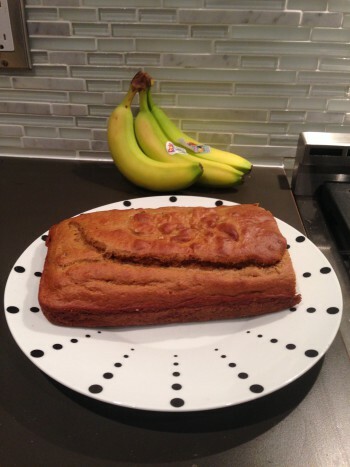 My all-time favorite thing to make – banana protein bread. And yes, my photography / food staging skills are outstanding – Kyle would be embarrassed. 3. Cottage cheese and jam (no sugar added). I’m really picky when it comes to cottage cheese – there’s ONE brand I can tolerate, and it’s expensive. So, when it goes on sale, I stock up and enjoy it for as long as the expiration dates allow me to. It’s saved me a few nights this week when classes at the gym have pushed meal times too close together. It’s a great source of protein in a pinch and even a small amount of jam adds some sweetness. 4. 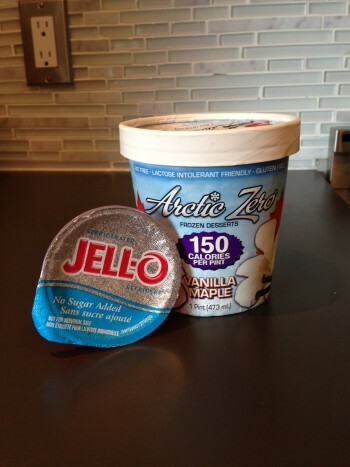 Sugar free Jell-O with Arctic Zero ice cream. It’s so easy, totally satisfies any sweet cravings, and it’s guilt-free! The only catch is getting Arctic Zero as it’s only in the US. Thanks Jessie for being my go-to girl!! A more typical “dessert” type snack, but without the fat and sugar. 5. These damn yogurt pretzels! I can’t keep them in the house because I can’t be trusted with them. 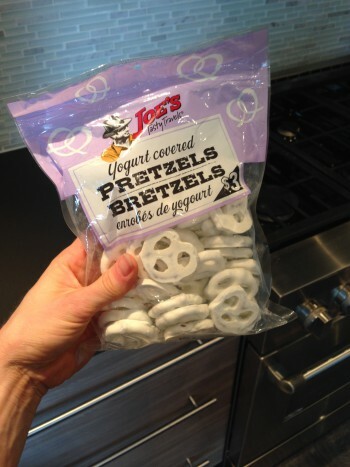 Ok… they’re not healthy, but they’re insanely good… and when you only eat a couple at a time, they’re not bad. These are dangerous to keep in the house. So, that was five… but some more ideas are: cucumber slices in stevia OR balsamic vinegar, an apple sliced with almond butter / natural peanut butter, mug cakes with protein powder, and I’m currently loving mini rice cakes (sweet chilli and dill pickle are topping the list right now). My snack options are usually dictated by the nutrients I feel I need at that time of day. If I don’t need carbs, I’ll go towards something a little lighter and focus on protein and vegetables to be more filling, like egg whites with broccoli and spinach. Snacks don’t have to be just a bag of chips or popcorn. Even though those are fine from time to time, incorporating more healthy options will leave you feeling better in the long run. Enjoy!! This entry was posted in Education, Food, Health, Nutrition, Personal, Wellness and tagged balance, eat clean, eat healthy, food, foodie, healthy eating, lifestyle, macros, nutrition, snacking, snacks healthy snacks. Bookmark the permalink.